In case you haven’t heard by now, Dion Lee is an Australian fashion label by the designer of the same name. Established in 2009 in Sydney, the brand is now sold globally at some of the world’s most elite retailers including Net-A-Porter and Bergdorf Goodman, to name a few. Already lauded for its sleek, chic apparel, Dion Lee has something exciting on the horizon. The brand will launch its first [SHOES] collection at its runway show at New York Fashion Week. And we can’t wait. Much in line with the brand’s already existent cachet, the collection features all your favourite footwear styles—but better. While Dion Lee has designed shoes before, it has only ever been at the capacity of one or two styles per season. In the past, the shoes have been fit thematically in accordance with the season’s line, so we’re eager to see a collection that is independent from the apparel altogether. Lucky for us, this time around the brand is spoiling us with a full-fledged collection. 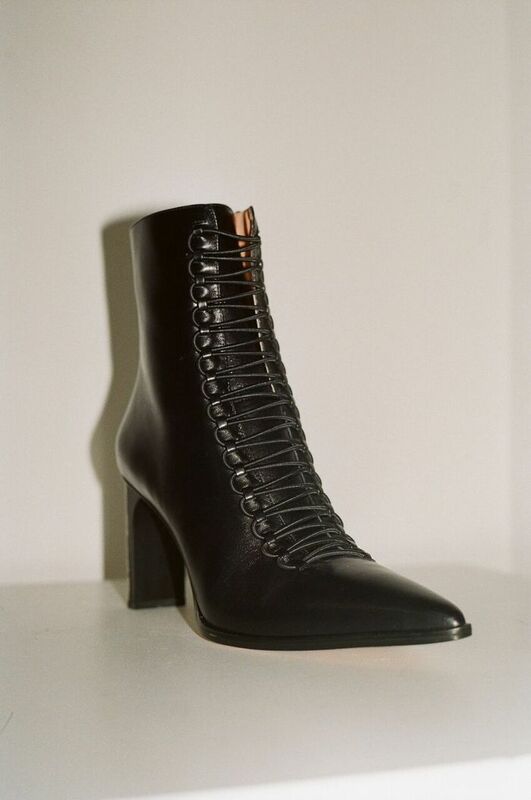 Combining Victorian-style lace-ups with slender silver heels, Dion Lee's [SHOES] is putting a new twist on old classics. Not to mention, the pointed toes feel very relevant in terms of elevated shoe options. While we can’t wait to see how these shoes appear on the runway, we’re equally interested in how they’ll be appearing in the on the cement runways as well. Equally adaptable for a night out or day at the office, we can imagine these shoes paired with silky black dresses, as well as jeans and a t-shirt. Sticking with neutral tones and red, this line will be wearable with virtually any outfit. Keep scrolling to see our favourites from the new Dion Lee [SHOES] collection below.